The argan oil, which is said to have restorative and anti-ageing properties, has become one of the latest miracle ingredients in the cosmetic products. The extraction of argan oil from argan nuts is a long (it takes a few days to produce one liter), labor-intensive and is thus expensive task. On the back of this, it is very important socially to rural women of Morocco (as this is the only place in the world it grows). In Earlier Times, Berber women in Morocco were running small family businesses of two or three people would collect the argan fruit nuts and extract its oil. Their husbands or brothers would then sell the oil in local markets or exchange it for sugar and other goods (as barter system). In recent years, however, women’s co-operatives have been created to meet the surge in demand. Nowadays, argan oil is produced almost exclusively by women’s cooperatives which provide a livelihood to otherwise vulnerable Berber community native to the region. The consumption of Argan oil by cosmetic companies provides many destitute women with jobs, income, safe working conditions, as well as a social experience and improved status. 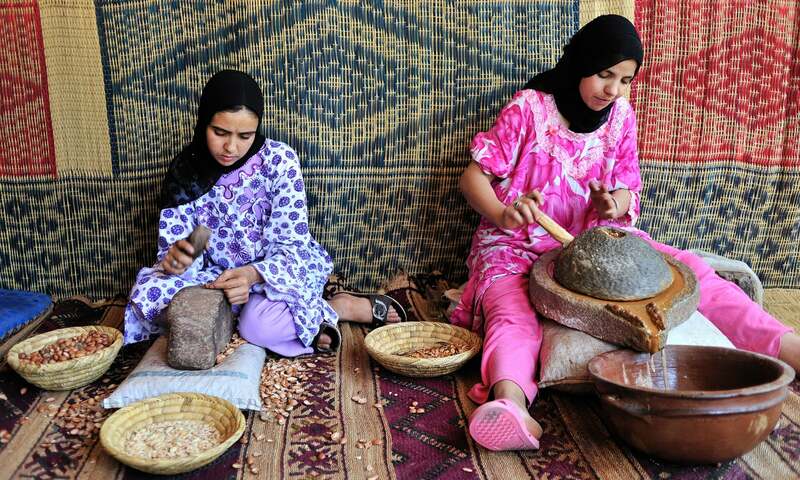 Most importantly, Argan oil sales provide women in the cooperatives the opportunity to join the Moroccan work force. It’s good to know that a beauty product millions of people like and using is helping women half a world away from us. It is more generous to buy a beauty product that is sourced in the frame of fair-trade to support the worthy cause of empowering the hard-working women in the Argan oil cooperatives in Morocco region. 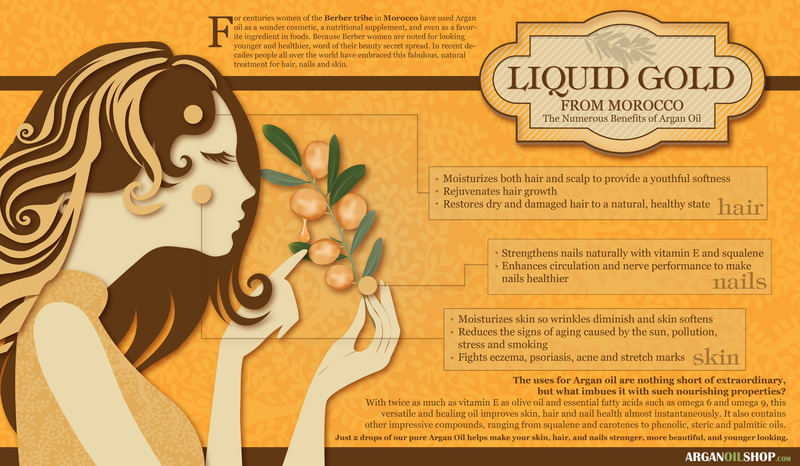 Liquid Gold from Morocco, the Numerous Benefits of Argan Oil For centuries women of the Berber tribe in Morocco have used Argan oil as a wonder cosmetic, a nutritional supplement, and even as a favorite ingredient in foods. Because Berber women are noted for looking younger and healthier, word of their beauty secret spread. In recent decades people all over the world have embraced this fabulous, natural treatment for hair, nails and skin. The uses for Argan oil are nothing short of extraordinary, but what imbues it with such nourishing properties? With twice as much as vitamin E as olive oil and essential fatty acids such as omega 6 and omega 9, this versatile and healing oil improves skin, hair and nail health almost instantaneously. It also contains other impressive compounds, ranging from squalene and carotenes to phenolic, steric and palmitic oils. Welcome to my blog dedicated to the liquid gold (as for celebrities) – ARGAN OIL. As I am great lover of natural beauty products, and I was born and raised in the Souss region of Morocco where Argan oil is produced. I decided to get a little creative and share some of my insights on Argan oil selling at high-end cosmetics stores in U.S.
I’d also like to share all about argan oil. All About Argan Oil. What it Is, Where it comes from, benefits & its uses and moreover dermatologist’s Tips on Using It. Would love to see your comments about my each blog post.